I know, I promised pockets next. I didn't realise there was so much more to do before getting to the pockets, so here's one more post before I get to them. I took some photos outside instead of inside at my dark work table. Wow. The photos came out so much better. It's just so hot outside right now, so I may not take all my photos outside. Also, it's hard to stop work to take a photo and then come back inside to keep working. Here is the button catch, with the buttonholes marked and basted, ready to cut. The finished buttonholes (with bright colours!). This button catch is lined with linen, and has a layer of wool on each side to finish it. Some of the buttonholes are better than others.... I've also made the finished side of the buttonholes face to the outside, even though they'll usually (and hopefully always) be covered by the facing flap of the button catch, but just in case they show they'll look neat and tidy from the front. Here's the finished and lined button fly. Note the difference between "button catch" and "button fly". I had trouble keeping the two apart, which led to a lot of reading and re-reading to make sure I was doing what was needed to the right side. I also referred to David Page Coffin's Trousers book to wrap my brain around button flies (flys?). Anyway, this is stayed with a triple layer of folded canvas to provide support for the buttons. Here's a shot of some of the additional stay supports in the trousers. Across the top are the waist stays, which are actually several shorter lengths of canvas, overlapped at the side seams and at the split points at the back of the waistband. Down the side seam is another stay, which goes to just below the pocket opening, and keeps the pocket opening flat, and also gives the pocket bag itself something sturdy to fell onto (in the next post). Finally you can see the two round button stays for the suspenders/braces. In the rear there are triangular button stays which go up into the back split points. The top of the trousers are cross stitched onto the waist stays. This seam will be covered eventually by the interior lining. Not shown, I pick stitched all around the waist stay to the front, about an inch from the top, to give the waist the support it derives from the stays. I am also primarily using Jason MacLochlainn's excellent book, combined with W.D.F. Vincent's CPG. Compared to your work, I have come to some slightly different interpretations on a few points. I wonder If you might be interested in discussing them? Specifically, in this context, cross-felling the staytape and the making-up of the button catch. As far as I can see the rest we did in exactly the same way. I will admit that I got a little lost around the construction of the fly, and ended up referring to David Page Coffin's excellent book on tailoring trousers, so that my completed fly is a sort of combination of the two sources. Do you have any photos of the method you used? The insights I gained came to me after finishing the trousers (isn't it always like that? ), so unfortunately no photos of the hopefully correct method yet. *)the cloth of the button-fly is shaped like the buttonhole-fly but has a square lower end, meaning no tapering to a point and being roughly the same width at the top and bottom. This fits nicely with the square, triple-folded and stretched linen described by J. Maclochlainn. *)I strongly suspect an omission in J.M. 's book detailing the making up of the button fly. I think the linen is basted to the button fly, the buttons are sewn through and then the inside is covered up with silesia, also covering the knots of the thread fixing the buttons. The drawings in Vincent's CPG III seem to support this. But as there are many trousers with the buttons sewn on through all layers, maybe both ways are all right. The manner in which the silesia covers the fly/trouser seam appears to be such that the silesia is a good bit wider than the turned edge of the cloth seam, plus a generous turn in. 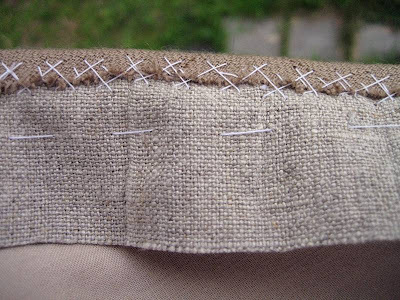 It appears that the edge of the silesia is not felled to the edge of the seam, but that the turned-in edge of the silesia completely hides the edge of the fly/trouser seam and is prick-sidestitched or prick-backstitched down just next to this seam to the seam-allowances on the trouser side. Also, the buttonfly/trouser seam appears not to be a normal opened seam, but both allowances turned to the trouser side, not away from each other. A Vincent's CPG III drawing, "Practical Tailoring" by J. E. Liberty and a 1916 austrian repro trouser I own seem to support this. As for the buttonhole fly, what the convention for "outside" and "inside" in the CPG was supposed to be, was giving me headaches. Is "inside" meant with respect to the sides hidden between the buttonhole-fly and the trouser topsides, or with respect to the trouser as a whole, meaning side to the body of the wearer is "inside"? I tend to the opinion that the finished layers are as follows: outside trouser cloth - silesia lining - buttonhole-fly layer from trouser cloth - buttonhole-fly linen - buttonhole-fly (silesia) lining. When I make another pair of trousers I'll be sure to use your info to help me along. We are following your wonferfull work, could you send us a photo from were the buttons are... thats a silly question, but we really need it. or even closer to the seam, with the outer edge of the buttons as good as touching the seam. Please notice that the top button goes on the fly side, with the hole on the catch side. This is a very common victorian method detailed in Jason MacLochlainn's book, the others would be with a wide hook and eye on top or a buttonhole on the fly side through all layers, showing the top button on the outside when the trousers are buttoned up (latter 2 methods probably rather for late victorian trousers). On the other hand, I own italian repro military knickers with the fly made up rather like Andrew did. Am I making any sense?